Because even the highest quality instruments eventually fail, process plants typically have redundant measurement devices for mission critical applications such as for process vessels. 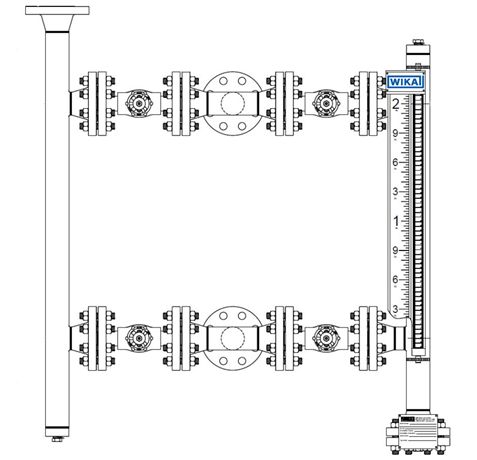 A dual level gauge, which includes both a magnetic level indicator (MLI) and a guided wave radar (GWR), is an example of a common redundant measurement system. In this configuration, if a transmitter in the GWR unit fails, you can still rely on visual readings from the MLI in the other chamber of the dual level gauge. When taking either a GWR or a GWR/MLI out of service, a differential pressure level transmitter unit is sometimes used to replace the malfunctioning GWR. The rationale for this stopgap measure is to get the level measurement reading back online ASAP and keep it going until the GWR can be ordered and installed during the next turnaround. Unfortunately, this solution has a major drawback that can impact the reliability of your level measurement readings. The differential pressure gauge output can be impacted by a significant temperature difference in the vessel and where the instrument mates to the vessel connections. When this happens, the indication in your control room won’t match the actual level measurement. This can lead to various issues, one of which is poor product quality, resulting in lost profits from rework, employee overtime and added sunk costs. A dual level gauge with isolation values eliminates the need for stopgap measures that can impact your operations and bottom line. An isolation valve between the MLI and GWR units allows you to isolate and make the repairs to a chamber while the process is still running. Visual indication is never lost because the MLI chamber is isolated and remains fully functional even when you depressurize the GWR chamber to fix or replace the malfunctioning unit. The team at WIKA is available to work with you to create a custom, engineered solution to meet your specific needs. 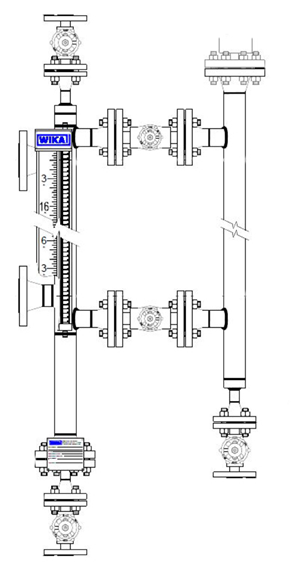 The images provide examples of two WIKA isolation valve designs for dual level gauges. 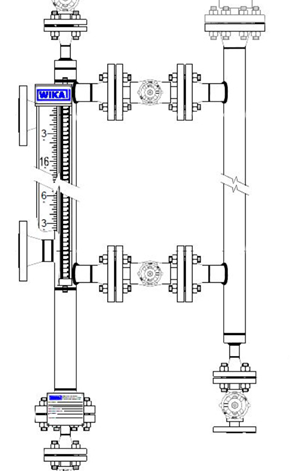 Figure 1: This design features a dual chamber gauge with the MLI connected directly to the process. This design uses flanges and valves for throughput to the guided wave radar chamber. As you can see, the two chambers are mounted side by side. Figure 2: This design includes one or more process connections and a “T” with flanges and valves to isolate the chambers. One arm of the “T” connects to the MLI and the other arm of the “T” connects to the GWR chamber. You can order the entire solution, including the GWR unit, the valves, and the MLI, or individual components, and we will work closely with your team on installation. 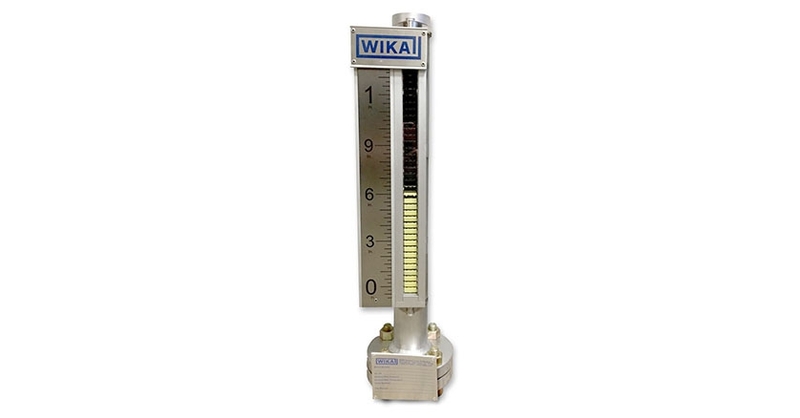 Contact WIKA’s knowledgeable technical staff to learn more about our new isolation valve dual level gauge solutions and our other products, including level transmitters, switches and sensors. The answer is yes! That being said it’s often times difficult to design unless it’s new construction as customers typically aren’t willing to modify their tank to add another tap. It’s not super critical for shorter lengths either. If it’s under 48” it doesn’t have a huge impact on the accuracy of the instrument.